Enter the Roots International Sweatpants Day Contest for your opportunity to Win a free flight to anywhere in Canada plus a travel package. To enter you need to like the Roots and Air Canada official Facebook pages, then locate the post promoting this contest and use the comments section to post a photo of you wearing your favourite Roots sweatpants tagging @roots and using the #InternationalSweatpantsDay and #Contest hashtags. You can also enter on Instagram and Twitter. Contest closes on January 25, 2019 at 11:59 pm ET. Winner will be selected by random draw from all eligible entries. 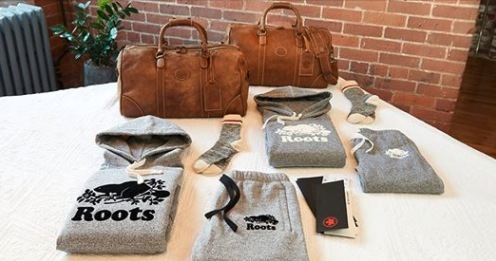 There is one prize available to be won, consisting of 2 pairs of Roots sweatpants, 2 sweatshirts, 2 leather passport holders, 2 small Banff bags, 2 pairs of cabin socks and 2 $1,750 Air Canada flight vouchers. The Roots International Sweatpants Day Contest begins on January 21, 2019 and ends on January 25, 2019. The draw will take place on January 28, 2019. Winner will be notified via the social media used to enter.